Twenty Thirteen Is Coming – What Should We Expect? It’s that time again when many security gurus stop to pause and reflect and what has been – and more importantly what is to come. Those security professionals who can correctly anticipate the impact of sweeping trends, will find themselves better positioned to deal with changes to their job function or duties and as a result will be in a much stronger position to proactively navigate their careers. Perhaps these three insights from Reuven Harrison, Tufin Technologies CTO, will help! What does that mean? We’re on the cusp of technological advancements that sci-fi movie fans have so far only dreamed of! Internet protocol version 6 (IPv6) is the key to a bigger, better Internet, and will form the backbone of the world’s next-generation broadband networks. So says Johannesburg-based broadband company, BWired. At present, the Internet has some 4.3 billion IP addresses, which was thought to be more than enough when the current IPv4 addressing scheme was created in 1977, according to BWired. But with the Internet becoming all-pervasive, it is likely that practically everything will be connected to the Internet within the next few years. As a result, 4.3 billion unique addresses do not seem like such a large number, the company says. With the launch of IPv6, the number of unique Web addresses can now grow to 340 trillion, trillion, trillion. Industry data suggests the current IPv4 addresses are rapidly being exhausted. How can companies move from IPv4 to IPv6? 1. Discover – Discover all IPv4 and IPv6 resources on your network to prepare for IPv6 and identify potential security gaps. 2. Plan – Plan your IPv6 environment based on a thorough understanding of your existing networks and IP addresses that are already in use. 3. Model – Create and model IPv6 blocks and networks including local and global unicast address space for optimal design. Add IPv6 hosts and define IPv4, IPv6 or dual addresses for each host. The rise of IPv6 could give you some severe security headaches -- even if you have no current plans to implement the new networking protocol. That was the stark warning issued by Eric Vyncke, a security expert from Cisco, talking at the RSA Conference Europe in London this month. On the face of it, there is not much to worry about with IPv6. After all, it is simply a protocol with a much, much larger address space than IPv4. That certainly makes rigorous network scanning impossible in practice, and it does away with the need for network address translation, but nothing changes at the data-link layer, the transport layer or the application layer. Ethernet, TCP, HTTP -- all remain unchanged. So what's the problem? There is a need for web site owners and business to enable IPv6 on networks and public facing Internet services. HackerTarget.com has completed a second survey of the websites in the Alexa Top 1 Million to review the latest progress. The survey tested each host for the presence of an AAAA DNS record. This is the record type that points to an IPv6 address. March 2012 conducted a similar survey, that was presented in an info-graphic. Since then there has been an awareness campaign and much press around World IPv6 day on June 6th 2012. These latest results are a good indication of how much progress has been made. In August 2012 there were 26776 IPv6 enabled websites in the Alexa Top 1 million. This compares with 11237in March 2012. U.S. and Canadian law enforcement agencies are warning that a historic switch to the next-generation Internet protocol called IPv6 may imperil investigations by making it more difficult to trace who's using which electronic address. FBI, Drug Enforcement Administration, and Royal Canadian Mounted Police officials have told industry representatives that IPv6 traceability is necessary to identify people suspected of crimes. The FBI has even suggested that a new law may be necessary if the private sector doesn't do enough voluntarily. This IPv6-related effort comes as the FBI is redoubling its efforts to combat what it calls the "Going Dark" problem, meaning that its surveillance capabilities may diminish as technology advances. CNET was the first to report last month that the bureau had formed a Domestic Communications Assistance Center to keep abreast of technological changes that may otherwise imperil government surveillance. More content providers have switched to IPv6 following the success of the World IPv6 Day test flight which went by smoothly and affected but a small number of users, said participants. In a phone interview with ZDNet Asia, Geoff Huston, chief scientist at APNIC (Asia-Pacific Network Information Centre), reported that there were no unexpected hiccups during World IPv6 Day. 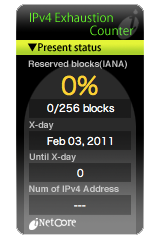 The event, which happened exactly one month ago, saw stakeholders of the Internet serve content over IPv6 for 24 hours. According to Huston, the success of the event led to more content providers delivering content over IPv6. He pointed out that prior to World IPv6 Day, only 0.5 percent of the top million Web sites ranked by Alexa had turned on IPv6. Post-World IPv6 Day, 1.2 percent of the top million sites switched on the new protocol, said Huston, who added the increase was "very encouraging". There has been much speculation over the years as to whether IPv6 will be a benefit or burden to businesses and Internet users. First and foremost, it is important to remember that the transition to IPv6 is inevitable. The last few IPv4 addresses are in the final stages of being allocated. Cisco has predicted that the Internet will quadruple in size over the next four years, and that there will be 15 billion Internet-connected devices by 2015. While IPv4 only allows for about four billion IP addresses, IPv6 will allow the world’s seven billion people to have 15 billion devices each, and still be infinitesimally utilized. Additionally, IPv6 is designed to be more effective in terms of security, reliability and ease of management. With the move to IPv6 imminent, enterprises need to re-work on their IT infrastructure to support the new protocol. The Internet Society predicts that IPv4 addresses allocated to Regional Internet Registries will run out this year. When that happens, many new applications and services will only support IPv6. Enterprises will be compelled to migrate from the universal IPv4 to IPv6. IPv6 is the successor to IPv4, which has been the standard Internet communication protocol since 1981. IPv4 uses 32 bit addressing which translates to a few billion addresses. While these addresses were adequate during the years, when the protocol was conceived, given the Internet growth today, they will soon be exhausted.